Do you ‘save’ your good clothes or do you wear them often? 40+ Style » What I wore » Do you ‘save’ your good clothes or do you wear them often? When I buy something new or rediscover an item in my wardrobe I often wear it multiple times in different outfits. Not only is it good to reuse certain items when they are still clean, it is also great to wear items that you really love at any one time. New items are (understandably) often my favourites and since I can tire of clothes quite quickly, it is essential to wear new items as often as possible. You can classify women in 2 categories. Those that save their good clothes for later and those that wear their good and new items as often and as quickly as possible. I definitely fall in the latter category. I think it’s crucial that you wear your good items really often. They get a lot more use and you get so much enjoyment out of an item that is still fresh. If you think that you fall in the first category, then please check your cupboard. How many times have your good items been worn? Do you still like them as much now as you used to when you bought the item? What are you preserving your good item for? If you come to the conclusion that you have hardly worn your good items or that you no longer like them, you may want to change your strategy. I take every opportunity to wear my good clothes. On this occasion I was going out for a quick casual diner with my own family at a local (not fancy at all) restaurant. It would have been fine if I went really casual and just put on some old attire (that’s of course what hubby and son did). But what is the fun in that? Why not take the opportunity to try something new? This particular outfit was not thought-through at all and I wouldn’t say it’s in any way a perfect outfit. It was ‘thrown on’ in less than 5 minutes. As I mentioned the occasion was very casual, so no need to spend too much time on the outfit. Still, by taking a picture I now have a new outfit combination and I can get some ideas of future outfits. The necklace is a golden oldie from Alldressedup and the little plastic bracelet from The Netherlands. Then there is my 20 year old watch from Bruno Nimaber. 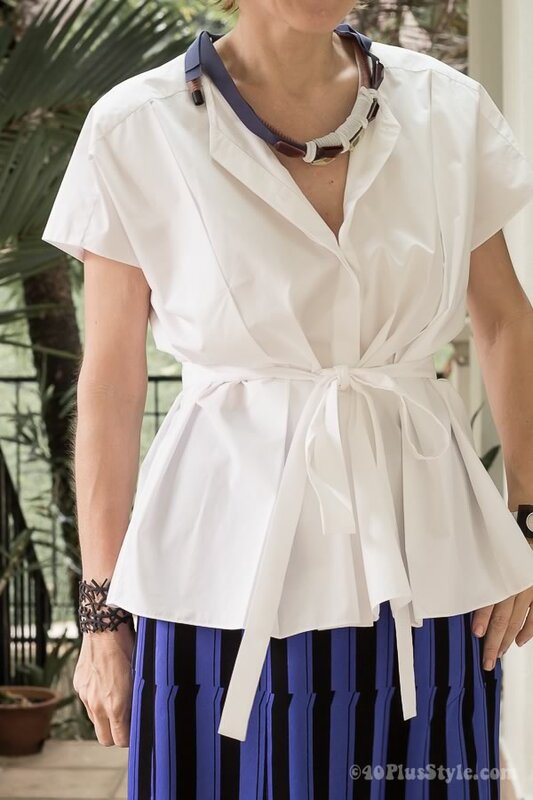 You’ve seen the shirt a few times earlier (Cos) and the new Bimba & Lola skirt was premiered on the blog in my article on my 5 fashion week outfits. The shoes are from a recent sale at CK Calvin Klein and are my compromise for open booties that are on my wish list. They are super comfortable and perfect for this casual diner! The hat is especially for The Style Crone’s hat attack. When I got dressed I remembered that I really wanted to enter this time as I adore her celebration of hats. Unfortunately, my collection of interesting summer hats is still very limited, but this little lightweight black hat always pleases me. I’m also joining the party at Patti and Nanda. So tell me, in which category do you belong? Do you ‘save’ your good clothes or do you wear them often? I belong to the second category – I wear mostly of my clothes regularly depending on the season. For me it’s a real joy to dress up. Life is too short to be frumpy and after my online course it has become even worse. :-)) I’ve learnt to split my outfits, mix and match and to add a sparkle what I wouldn’t have done in the past. By the way – yours is a very stylish outfit! Thanks Catia. Keep adding that sparkle! No way will I be saving my good clothes. What a waist of money. If something looks good on my, why would I save that for a few times a year? So I am with you. Your outfit is very well “thrown together”. I like all the items, but you know that I prefer such flat shoes with trousers, especially when the skirt is a bit longer. But I realise you cannot wear boots in Singapore. And you are more modern with shoe wear than I am. Thanks Greetje. This was a very casual event so I thought low shoes would fit better, otherwise the outfit would have been too dressy (and my husband likes to walk FAST). I’m still on the lookout for some open booties with reasonable heels, which I think would look excellent with this outfit! Definitely, the second group ! I wear them so often, that I have to customize them to try going a little bit further ! I love sewing so, it’s a way to have new DIY projects to manage ! That is a great idea Madeco! I always wished I had that skill. Tried for a few months, but it’s not for me. Many years ago, I had a wonderful red dress. I looked SO good everytime I put it on. And it was well made, good quality and quite comfortable. But I didn’t have that many occasions to wear it to, so it spent a lot of time in the closet for those perfect occasions. Then I had three children in a little over five years and at the end it didn’t quite fit. (understatement) After child 3 I exercised, dieted and eventually got back down to my pre-children size and took out said red dress which had been just waiting for me all those years. It was a short-lived victory. The dress still fit and looked good in a retro sort of way but it was SOOOOO dated I couldn’t wear it out of the house. Great story Lisa and glad that you now belong to the second group! I so agree with you. You have to dress to please yourself. very interesting to think about your red dress. it was almost like you went back in time but find that you are no longer the same person (even though you went back to the red dress weight). that dress is like a siren call but in the end it was only good to get you back in shape. I don’t know that it was a siren’s call for me. It was definitely a lesson about learning to live in the moment, but with a houseful of preschooler and toddlers, I think I was already pretty moment to moment sans dress. I think of it more as a funny story about my own human failings, than anything particularly profound. But like all stories, the meaning comes only partially from the speaker. Some of the meaning is given to it by the listener. And if this story brings the siren’s call to your mind, and speaks to you about your own life journey, then you are welcome to learn from it. I save, I save but you’ve really made me think about it ! I have for example beautiful clutch bags that have never seen the light of day. Thank God they never go out of fashion. I am going to amend my ways from tomrrow and I have decided to put my never-used new coat at work to-morrow. It will take a lot of willpower though !! Great resolution and good luck. You can do it! Let me know how it feels. And be sure to take your clutches out as well. They are very popular right now to ‘wear’ during the day. Yes, that is a good reason too! Throwing together an outfit in five minutes is a talent that shows itself in your beautiful photos. It’s spontaneous and fun. And the artistic composition thrills me. The hat tops off your ensemble with perfection. So excited that you shared it on Hat Attack! I spend an hour (sometimes more) at the beginning of the week putting hypothetical outfits together. (It inevitably changes, but it gets me trying new combinations and using forgotten items.) If I ever show up completely in neutrals, you’ll know I dressed on the spur of the moment! Thank you so much Sylvia for joining me in my blog. Much appreciated!! Well, taking away some pieces that are too dressy for work, I like to wear my good clothes any time I want. I agree with Greetje, what a waist of money. And if we don’t wear them in the end we might have to deal with a situation like in Lisa’s story. Unfortunately I gain some weight now, if I haven’t worn my clothes I would be in a situation of a full not used clothes wardrobe to give away. Your outfit is very stylish and it shows your taste and talent to quickly dress in such a wonderful way. Thank you dear, you’re kind. I tend to be in the first category, mostly because I get frustrated when my favorite things wear out and I can’t find anything similar. But you make me think I have the wrong attitude. If I had that top and that skirt I’d be wearing them A LOT! They look great on you. Neither is wrong Val. If preserving your clothes works for you and gives you the satisfaction that you always have something nice to wear, then just stick to it. If however, you find that you not worn these clothes enough before they lose their appeal, then you may want to reconsider…. This – is complicated. I have tried to do better at wearing most of my purchases while they are still new and on trend. This actually starts in the store where I ask myself if the item I want to buy 1) truly fits my lifestyle and 2) fills a “need”. No matter how much I love cashmere sweaters I can only really wear so many. Also, and I learned this here, when I buy something now I try to get rid of something I already own. I saw a black coat I’d like to have and I told Greetje if I do get it I will donate two from my closet. On the other hand, I own many pretty dresses that I no longer have occasion to wear (we used to attend many more formal events than we do now) but I can not bring myself to part with most of them. I am hopeful I will find an excuse to wear them again. We are invited to a wonderful party on the 9th and I have the perfect outfit – including a new pair of high heels – but I will be be out of town that whole weekend at a football game so I will be bundled up in a parka and boots instead of wearing a gown. I guess maybe like Lisa said above, the day may come where I will look at my beloved dresses and realize they are no longer fashionable and I will let them go. I am just not ready yet. In the interest of honestly – none of these “rules” applies to shoes or bags. No woman can ever own too many of either of those items. LOL! Yes, formal dresses can be difficult. I can imagine that you are not willing to part with those! I think they can just be kept for the joy of looking at them every now and then. Totally agree with your stylist. You can wear ‘good’ jewelry every day too! What is the point of having them in cupboards. That reminds me to bring out one of my own hardly ever worn necklaces…. Suzanne: I suppose it is not an option to skip the game and go to the party? I know you “do” games a lot and you do not “do” parties a lot. Have a change, have a break, have a kit-kat. Hahaha! This is American college football Greetje. Very good tickets (bought months ago) for a very big game, a nice hotel to stay in, and 60 Frat boys (I love each and every single one!) waiting for home-baked cookies. There is a “tailgate” party all day Saturday, which does not require dressing up, but is more fun than a barrel of monkeys. But you are right – I have been doing the college thing since my daughter’s first year in 08/09 (and my son’s since 11/12) and the formal parties have been fewer and fewer since then. Now I have to buy a bag of Kit-Kats to take with me! LOL! I’m getting much better at falling into the second category, especially since I began blogging. I love shopping and buying new and fun items to only find myself waiting for the perfect opportunity to come up to wear them, which is not a great plan. I’m learning its much better to just create my own opportunity and begin wearing them right away. I was hoping to see more of this incredible skirt once I saw it on your face book post. It’s simply wonderful. Love how you showed it as a casual attire, since it could so easily be dressed up with a pair of black heels. Yes, I think that’s what you need to do: create your own opportunities! I love that thought, Sylvia. You are so right. I will remember that. Clean, classic, gorgeous Sylvia. Every single piece is strong. I usually have the best luck throwing outfits together quickly. I’m definitely in the “wearing the good stuff” category. I love street-proofing gowns but rainy weather limits how much I can wear maxis comfortably outside. Thanks Melanie. Yes, rainy weather can quickly ruin a garment! I was brought up to save things for best (and eat everything on the plate!). It is a difficult habit to break and as a result I have a lot of lovely things that have not been worn enough. Some of this is also due to no longer working in an office and some is being attracted to things that I never have the opportunity to wear. Since doing Sylvia’s course I have got better. However, when I was diagnosed with breast cancer earlier this year, one of the many thoughts going through my head was that I wouldn’t get to wear a lot of my clothes because I would be dead! Of course, I am not dead (and hopefully not for some years!) so I am taking every opportunity to wear things and buy new items to wear straight away! Interestingly, the idiocy of ‘saving things for best’ came home to me in October when there was a call to donate old bras to raise money for breast cancer research and I found a number of lovely lingerie sets (complete with tags) that I had been saving for best and that no longer fit me. Doh! Happily I have sold them on ebay and will be donating the cash! From now on there will be no nonsense. Life is too short! Great story also Lorraine to illustrate the point! Although a small thing, something good came from something bad. Indeed dear, wear all your lovely things as much as possible. Wow Lorraine – this truly puts it all in perspective. Thank you for sharing this. First of all Sylvia, you look wonderful in the outfit and I love the shoes! Secondly, I fall into the not wearing new clothes category. I also think I need to play around with new purchases more and create outfits. I tend to put my new clothing in my closet after purchase never trying them on to see how they work into my wardrobe. On the good side though, I don’t buy indiscriminately so my closet is pretty small. I also work 3 days a week for a clothing retailer and need to wear that manufacturer’s clothing on those days. Thanks Rebecca. Yes, play around a bit with your new clothes this weekend and come up with some outfits. At least it’s a fun exercize! Hope you work for a nice retailer? Then you are lucky to be wearing new clothes all the time right? I just purchased your Style Course and am really looking forward to using it and the forum. I am having a problem in resetting my password to the forum and would appreciate any assistance you can give me. I tried to reach you via the e-mail generated by the website and was unable to so I am using this way to contact you. Thanks for your purchase Rebecca. I have just replied to your email. your outfit is outstanding!!! Fit you so perfectly. It is fun, slightly edgy (accessories), comfortable looking, and totally suits your body type. A 10 from head to toe! I think people save favorites may have more of a fantasy wardrobe, ie, it’d be perfect for a…..(occasion) kind of thinking. The buying is to fulfill a dream, a wish, a hope, a vision. Thanks! Yes, today is what counts! Latter category 99% of the time, although I am guilty of neglecting a little black dress that I bought in my early 30s, and which no longer fits. Three months from 40, I’ve pared back my wardrobe by nearly 50% and cut back on cheap impulse buys. I’m looking forward to dressing in my 40s! Perhaps it’s time to let you of that dress Elizabeth? I try to wear them often! It’s easy for me to be lazy and wear jeans too often, since I work on my own. I have to make a conscious effort to do better when I go out! Exactly, it’s all about making a choice. I do adore this outfit! I like everything here especially your accessories. They are what makes this outfit so unique and personal to your style. I don’t know if I fit on these two types. When ever I buy something I wait a couple of weeks before I wear an item just to make sure I really love the piece. Interesting that you should post about this … it’s a subject that’s been on my mind lately. I suddenly find myself at the age when I what I buy now may well be in my closet when I die! That might be a slight exaggeration, and certainly it’s a reminder to weed my closet more often! But I have recently begun to consciously enjoy my wardrobe more, and remember that my best things are not all that precious … just clothes. I’ve found myself making jeans more fun with a great jacket or blouse, better jewelry and shoes. I’m going to wear out my favorite shoes BEFORE I die or they become dated. Whichever comes first! I think you make a good point. They are just clothes and they are meant to be worn. Great to hear that you are enjoying your wardrobe more! In the end you have to do whatever works best for you! I apologize because I’ve already commented a couple times on this thread, but the topic is interesting to me — itself something to reflect on. I know I do this “saving vs. spending” in other areas of my life. In the summer, I love fresh raspberries, but they’re pretty expensive and we’re on a budget so if I buy a half-pint I try and save them to use a few for my breakfast several days in a row. I think I try and stretch them out so it doesn’t feel like such a splurge if it’s divided over five breakfasts. Inevitably, I end up throwing some out before they’re all gone, which really is more of a waste than if I’d just washed the carton when I got home and sat down to eat every one of them in one sitting. I wonder if similar thinking went into saving that red dress. I was working when I bought it, but knew I was starting grad school soon, and it was certainly more expensive than what was “normal” at the time, and definitely more than I should have spent with school on the horizon. I think I was rationalizing “spending” more than I ought by then “saving” the dress. It sounds like overspending and then saving is something that ties together some of these threads. You can comment as often as you like Lisa! I used to do that too, but over time I have just learned that it does not work that way. As you say, you eat the berries too late, or you simply don’t like the dress any more. Some of my ‘good’ stuff I’ll like forever while some of the others I don’t. For me it’s rather safe than sorry so I wear it all. The pieces that I continue to love are the icings on the cake and will give me some interesting pointers as what to buy in the future. But at least I had (some) pleasure of my other new things too. This is an interesting topic, Lisa! This IS an interesting topic, really making me think long and hard about the pattern of using what I have in the closet, kitchen, jewelry box, etc..
Good dishes, expensive jewelry, delicate fabric/bags/shoes all see the light of day far less than the workhorse items we don’t care if they break, chip, scratched, worn, dirtied, missing, or lost. Why do we keep collecting or safeguarding the seldom used items?? If I like something so much do I have to own it? What’s stopping me from enjoying (using) what I love? Is it time for me to lighten up the load and pass the treasures to others?? Is it time to take them out and to use them while i can? Oooh, I love those shoes! I am a person buying clothes to last almost a lifetime and I wear it over and over again. My biggest problem is when I bought a peace the desire to wear it fades. Only after a few weeks I start wearing it, then I cannot stop. How do you feel about kitten heels for women over 40? How do you measure the success of your purchases? Do you use cost per wear? Previous post: Going through a midlife (shoe) crisis or necessary shoe upgrade? Next post: Does beauty matter and how much is it worth to you?